“Sustainability, veganism and health are three macro trends that will continue to shape the beverage market in 2019, says UK flavour and fragrance company, Treatt. From fermentation to exotic flavours, it outlines five areas to watch in the coming year. Consumers are increasingly seeking to care for their physical and mental health; while also becoming increasingly conscious about the environment. Vegetal and herbal products will drive innovation across a number of different categories, as vegetarian, vegan and plant-based lifestyles continue to grow in popularity. Consumers are becoming increasingly concerned about the efficacy of vitamins and supplements, opening up an opportunity for whole foods with purported medicinal properties. Aloe vera, cannabidiol, coconut and algae will continue to be popular ingredients in beverages to meet consumers nutritional goals. Protein and dietary fibre will be formulated into products to enhance texture, meet consumers’ macronutrient needs, and boost overall appeal. On-the-go functionality remains a key driver for purchases. Consumers are also looking for ethnic flavours, opening the way for exotic spices such as cardamom, ginger, turmeric and jalapeno. Consumers are increasingly conscious about their health; and sugar is a big part of their concerns. Bitter and sour beverages are growing in popularity as consumers perceive them to be ‘better-for-you’, while people are gradually getting used to products that are less sweet. Celery juice is a rising star on social media, while vegetables in general are becoming increasingly trendy. Mixologists are also turning to bitter ingredients in cocktails such as aquafaba – a vegan foam made from the discarded water from chickpeas – which also create new textures. Meanwhile, consideration of sustainability is boosting the use of seasonal, foraged and by-product ingredients: such as the use of wonky fruit or unwanted fruit peel in beverages from cocktails to flavoured water. With consumers increasingly wary of carbonated soft drinks over sugar and sweeteners, tea is well positioned as an alternative to both CSDs and alcohol. Consumers are looking for products that claim to help them live better: whether this is antioxidant boosting, stress-relieving, and aid for immunity or help with weight loss. Meanwhile, exotic blends and adaptogenic ingredients will continue to be formulated into cold brew and iced teas. The bottled water category is growing – set to overtake all other non-alcoholic beverages – and with its growth it is evolving. The functional water category in particular is innovating fast, driven by health-conscious consumers. Added vitamins, collagen, minerals and natural caffeine are just some of the ways functionality is being added to drinks. In the unsweetened beverage category, flavours such as citrus fruit will remain strong. Zenith Global predicts that – in the UK alone – the water plus market will reach more than 620 million litres by 2022. Digestive health has been a ‘significant trend’ in 2018 – but one that is yet to reach its full potential. Highly processed foods are out-of-favour: opening the way for natural processes such as fermentation (which also help create clean label products). 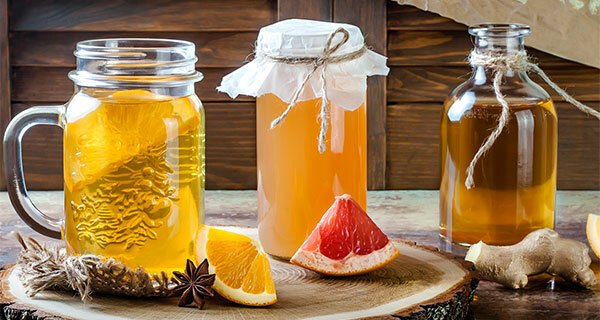 More and more probiotic beverages – such as milk and water kefirs, alongside vinegar-based beverages – will continue to emerge in 2019, with kombucha expected to be the next go-to mixer.